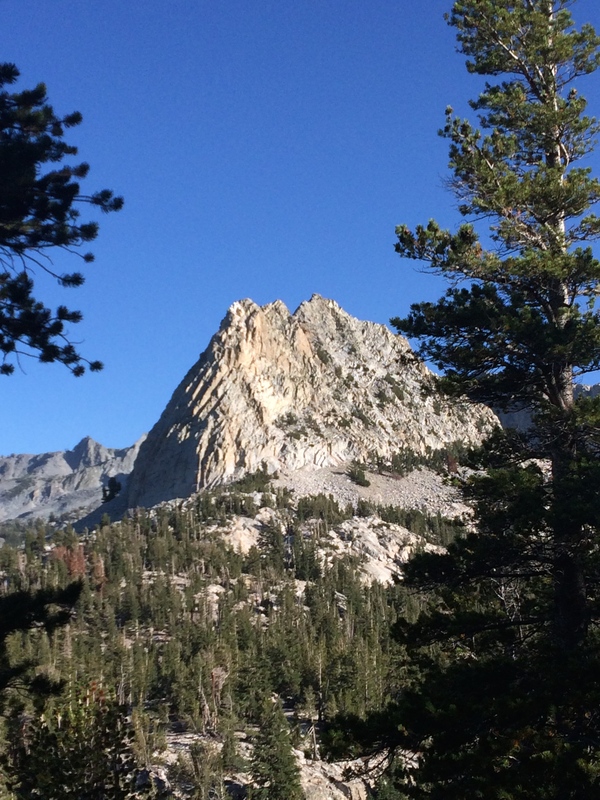 The rock tower Crystal Crag sits just outside Mammoth Lakes California. My niece Sabine, her friend Derek and my brother-in-law Matt climbed to its summit. While this adventure may not involve small children, it does involve kids under 18 and I think that counts as a family adventure. This is their story- Your incentive to reach the end is a flow chart! Here it is. Crystal Crag in all its glory! It took fifteen hours and thirty-four minutes to arrive safely in Mammoth. I live a mere six hours away by car, but this time I decided to fly. Sometimes, what was scheduled to be a one-hour flight can transform into a series of unfortunate events; an uncalled-for cancellation, two bus rides, hours of conversation with crusty strangers, another plane flight (at higher stakes) and a car ride. As genuinely fun as it all was, I felt happy to know that not even a malfunctioning aircraft facing a mountain gale could keep me from my favorite place on Earth. With climbing almost every day this summer, taking a trip to Big Bear, participating in an aid class in Taquitz, requesting a private lesson, and taking part in a crack clinic, nothing but an act of God (flood the state!) could keep the Sierras away. I made it, and I wasn’t leaving. After a taxing day of playing the game “will Derek make it to Mammoth?”, I was ready to climb. Excited to reach the base of our route, I tackled the approach with enthusiasm and an equally helpful acclimation to the altitude. Our line of hikers included: me, carrying all our food in a marmot-proof bear bin, Derek, with a rope, my dad, with a rope and the gear rack, and my mom, with a camera. Derek: Sabine stormed up the trail and our looming route seemed more promising than ever. Towering above two alpine valleys, Crystal Crag is a friendly face in the front country: not too steep, flat, long or short. The day couldn’t have been better—no clouds, wind or heat. Best of all, there were no other people. As amicable as ever, the mountains were in their best state for our first alpine climb. Sabine: With no other climbers in sight (…yet), we decided on the North Arête, a four-pitch 5.6 to the false summit and a 4th class traverse to the true summit. Derek: Pitch one started with a steep chimney that was supposed to be a crux. The gear turned out to be a huge burden because after the initial moves few placements were necessary. The first belay station was cozily tucked behind a tree on the arête, yet opened to a fantastic drop and panoramic view. We split the rest of the climb into three more pitches, with Sabine leading her first traditional and alpine. Our three people system proved cumbersome, yet completely worth it. Two other parties shared the rock with us, and luckily only several buttons were pushed. The true crux was actually the short third pitch, although exposed and steep, it was no harder than 5.7/8. Carefully, we climbed the loose crystal section, the capstone to the climb. By this time, the afternoon sun was blazing, and we felt the onset of tiredness. Sabine: Upon reaching the crystal pitch, I was struck with the beauty of climbing on a sparkling white surface. Obviously, my first thought was, “how can I get an insta out of this?”. Luckily, Derek was way ahead of me. Belaying me from the fourth station, he took some pictures that even my non-climbing friends would appreciate. The view from the false summit was incredible. I’ve been to Crystal Lake many times, but this was the time I was looking down from, not looking up at, the giant rock jutting into the sky. Derek: The terrific ridge traverse was next. 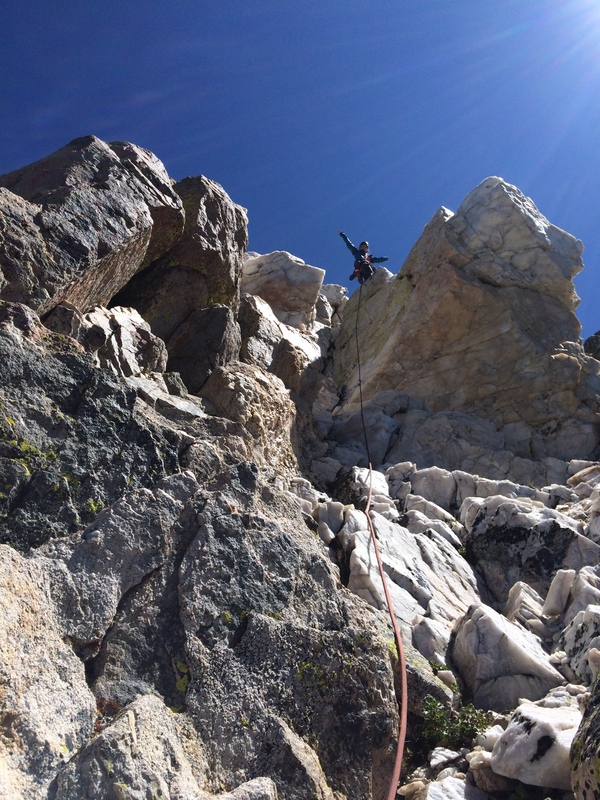 Possibly my favorite part, Sabine and I traversed simultaneously while her dad belayed us to the next notch. Down climbing some sections proved to be challenging, yet luckily never dangerous. 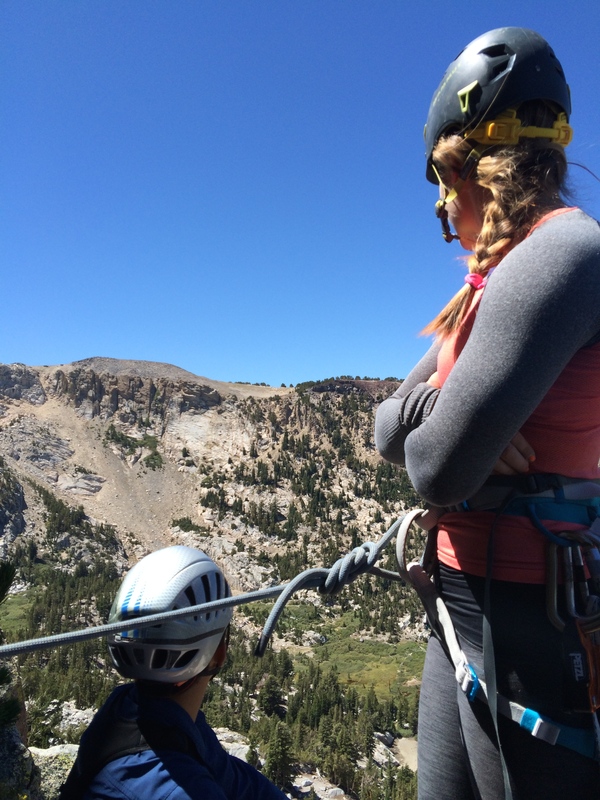 This slow process continued, but was not a problem; it was more time to enjoy the lakes and view of Mammoth Crest. 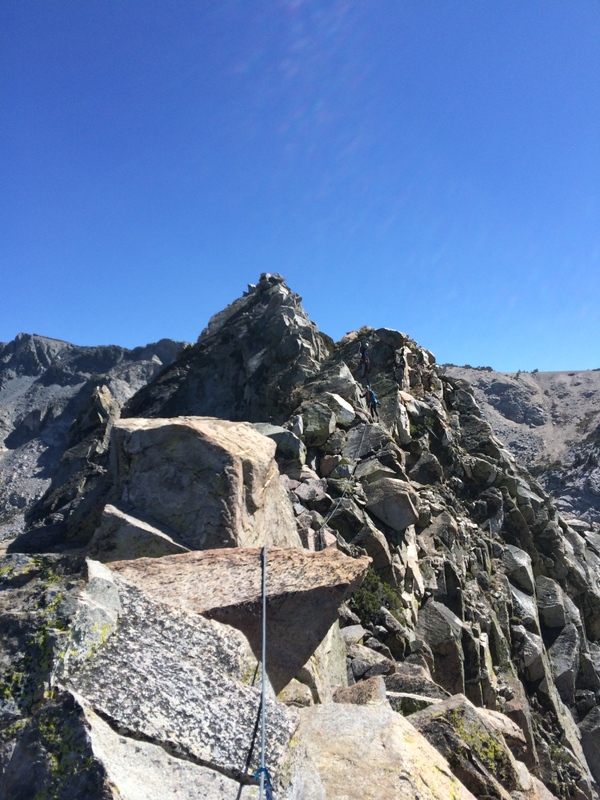 Sabine: We started our ridge traverse, with Derek placing pieces as he felt necessary, and me 10 feet behind providing a running commentary about the quality of those placements. It was especially fun to try to predict his speed, because if I moved too fast the slack would build up, and if I moved too slow I would be yanked ahead anyways. Fortunately, we made it across the ridge without anyone sliding off, and took the 3/4th class descent to the base. At this point I was ready to eat the next Golden-Mantled Ground Squirrel we came across, but thankfully our bear bin awaited us at the bottom. We gorged ourselves on goldfish, “if I eat the whole bag, would that be 1,000 calories?”, and raced down to the trailhead. We had just enough time before sunset to go hot potting (to non-Icelanders, that means going to the hot springs), which despite the high possibility of nudists is definitely the best post-climbing activity. Overall, I would highly recommend Crystal Crag, especially if you want to push yourself to do your first traditional alpine climb. But don’t take my word for it; follow my handy flowchart to see if YOU are cut out for Crystal Crag! 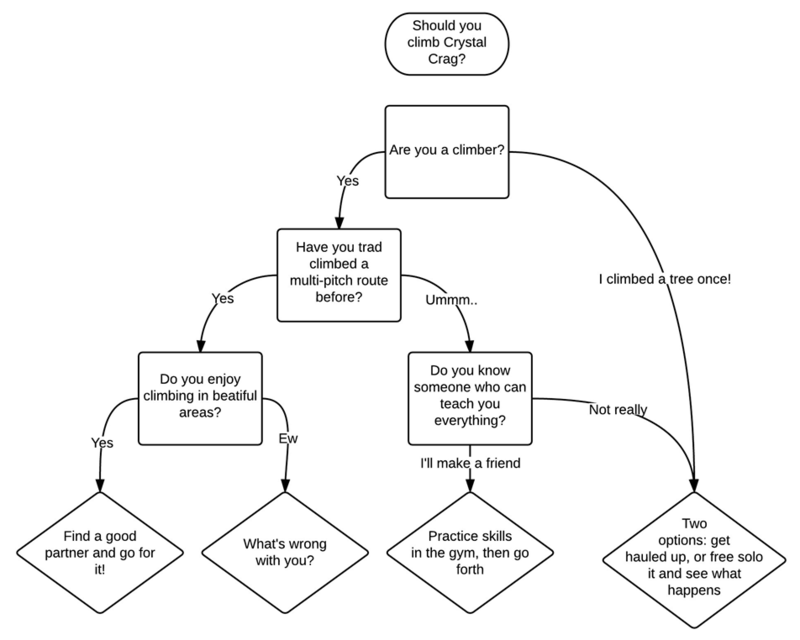 Are you curious about Trad Climbing? Click this link to learn more! 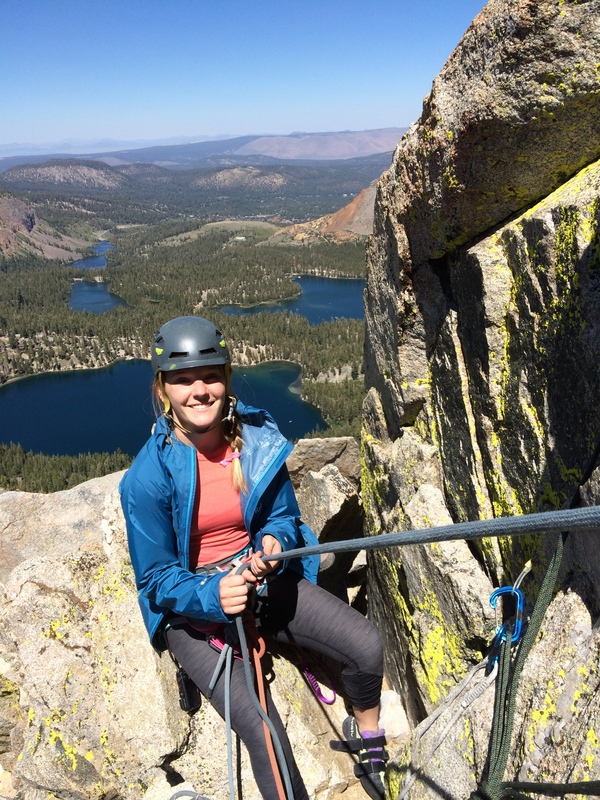 This entry was posted in Rock climbing and tagged Crystal Crag, Mammoth, Rock climbing, Sierra Mountains, trad climbing. Bookmark the permalink. Neato post! Wish I was as cool as those teens! It’s not very often you see them come out from behind their phone screens, am I right? Great post! Now I want to climb CC but I haven’t even climbed a tree!